Your first paragraph ...The flag of India is widely adorned by its people and like most nations they are incredibly proud of it. The late Prime minister of India called it “a flag not only of freedom for ourselves, but a symbol of freedom for all people”. The flag was adopted on the 22nd July 1947 by the constituent assembly who also applied a strict code to the flag outlining its proper uses. 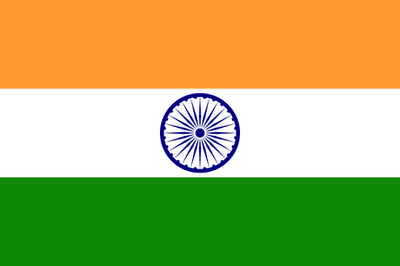 As I am sure you can see from the picture of the Indian flag below, it is made up of three horizontal stripes of equal proportion. The meanings of the colours are a cause for great debate. Some people say that orange represents Hindus, green for Muslims and white for the everlasting peace between them. The more accepted meaning is the saffron represents courage and sacrifice, white in the middle which represents purity and dark green at the bottom representing faith and fertility. As you can see in the centre of the flag there is a blue wheel, this represents the Dharma Chakra and the wheel of law, an ancient Buddhist symbol dating from 200 BC. The wheel has 24 spokes which symbolise that there is life in movement and death in stagnation. The original flag code was incredibly strict indicating that the Indian people where only allowed to fly the flag on particular days and in particular places. On 26th January 2002, the flag code was changed and the rules greatly relaxed. After 52 years, the people of India are free to fly the flag wherever and whenever they wish. Some basic rules remained and I have listed them below. 1. The National Flag may be hoisted in educational institutions (schools, colleges, sports camps, scout camps, etc.) to inspire respect for the Flag. An oath of allegiance has been included in the flag hoisting in schools. 2. A member of public, a private organization or an educational institution may hoist/display the National Flag on all days and occasions, ceremonial or otherwise consistent with the dignity and honour of the National Flag. 3. Section 2 of the new code accepts the right of all private citizens to fly the flag on their premises. 1. The flag cannot be used for communal gains, drapery, or clothes. As far as possible, it should be flown from sunrise to sunset, irrespective of the weather. 2. The flag cannot be intentionally allowed to touch the ground or the floor or trail in water. It cannot be draped over the hood, top, and sides or back of vehicles, trains, boats or aircraft. 3. No other flag or bunting can be placed higher than the flag. Also, no object, including flowers or garlands or emblems can be placed on or above the flag. The tricolour cannot be used as a festoon, rosette or bunting.